4. What Are the Characteristics of God's Teachers? 11 All other traits of God's teachers rest on trust. Once that has been achieved, the others cannot fail to follow. Only the trusting can afford honesty, for only they can see its value. Honesty does not apply only to what you say. The term actually means consistency. There is nothing you say that contradicts what you think or do; no thought opposes any other thought; no act belies your word; and no word lacks agreement with another. Such are the truly honest. At no level are they in conflict with themselves. Therefore it is impossible for them to be in conflict with anyone or anything. 12 The peace of mind which the advanced teachers of God experience is largely due to their perfect honesty. It is only the wish to deceive that makes for war. No one at one with himself can even conceive of conflict. Conflict is the inevitable result of self-deception, and self-deception is dishonesty. There is no challenge to a teacher of God. Challenge implies doubt, and the trust on which God's teachers rest secure makes doubt impossible. Therefore they can only succeed. In this, as in all things, they are honest. They can only succeed because they never do their will alone. They choose for all mankind, for all the world and all things in it, for the unchanging and unchangeable beyond appearances, and for the Son of God and his Creator. How could they not succeed? They choose in perfect honesty, sure of their choice themselves. 13 God's teachers do not judge. To judge is to be dishonest, for to judge is to assume a position you do not have. Judgment without self-deception is impossible. Judgment implies that you have been deceived in your brothers. How then could you not have been deceived in yourself? Judgment implies a lack of trust, and trust remains the bed-rock of the teacher of God's whole thought system. Let this be lost, and all his learning goes. Without judgment are all things equally acceptable, for who could judge otherwise? Without judgment are all men brothers, for who is there who stands apart? Judgment destroys honesty and shatters trust. No teacher of God can judge and hope to learn. 14 Harm is impossible for God's teachers. They can neither harm nor be harmed. Harm is the outcome of judgment. It is the dishonest act that follows a dishonest thought. It is a verdict of guilt upon a brother and therefore on one's self. It is the end of peace and the denial of learning. It demonstrates the absence of God's curriculum and its replacement by insanity. No teacher of God but must learn—and fairly early in his training—that harmfulness completely obliterates his function from his awareness. It will make him confused, fearful, angry, and suspicious. It will make the Holy Spirit's lessons impossible to learn. Nor can God's Teacher be heard at all except by those who realize that harm can actually achieve nothing. No gain can come of it. 15 Therefore God's teachers are wholly gentle. They need the strength of gentleness, for it is in this that the function of salvation becomes easy. To those who would do harm, it is impossible. To those to whom harm has no meaning, it is merely natural. What choice but this has meaning to the sane? Who chooses hell when he perceives a way to Heaven? And who would choose the weakness that must come from harm in place of the unfailing, all-encompassing, and limitless strength of gentleness? The might of God's teachers lies in their gentleness, for they have understood their evil thoughts came neither from God's Son nor his Creator. Thus did they join their thoughts with Him Who is their Source. And so their will, which always was His own, is free to be itself. 16 Joy is the inevitable result of gentleness. Gentleness means that fear is now impossible, and what could come to interfere with joy? The open hands of gentleness are always filled. The gentle have no pain. They cannot suffer. Why would they not be joyous? They are sure they are beloved and must be safe. Joy goes with gentleness as surely as grief attends attack. God's teachers trust in Him. And they are sure His Teacher goes before them, making sure no harm can come to them. They hold His gifts and follow in His way because God's Voice directs them in all things. Joy is their song of thanks. And Christ looks down on them in thanks as well. His need of them is just as great as theirs of Him. How joyous it is to share the purpose of salvation! 17 God's teachers have learned how to be simple. They have no dreams that need defense against the truth. They do not try to make themselves. Their joy comes from their understanding Who created them. And does what God created need defense? No one can become an advanced teacher of God until he fully understands that defenses are but the foolish guardians of mad illusions. The more grotesque the dream, the fiercer and more powerful its defenses seem to be. Yet when the teacher of God finally agrees to look past them, he finds nothing was there. Slowly at first, he lets himself be undeceived. But he learns faster as his trust increases. It is not danger that comes when defenses are laid down. It is safety. It is peace. It is joy. And it is God. 1 The ego is idolatry—the sign of limited and separated self, born in a body, doomed to suffer and to end its life in death. It is the will that sees the Will of God as enemy and takes a form in which It is denied. The ego is the "proof" that strength is weak and love is fearful, life is really death, and what opposes God alone is true. 2 The ego is insane. In fear it stands beyond the Everywhere, apart from All, in separation from the Infinite. In its insanity it thinks it has become a victor over God Himself, and in its terrible autonomy, it "sees" the Will of God has been destroyed. It dreams of punishment and trembles at the figures in its dreams, its enemies who seek to murder it before it can ensure its safety by attacking them. 3 The Son of God is egoless. What can he know of madness and the death of God when he abides in Him? What can he know of sorrow and of suffering when he lives in eternal joy? What can he know of fear and punishment, of sin and guilt, of hatred and attack when all there is surrounding him is everlasting peace, forever conflict-free and undisturbed in deepest silence and tranquillity? 4 To know Reality is not to see the ego and its thoughts, its works, its acts, its laws and its beliefs, its dreams, its hopes, its plans for its salvation, and the cost belief in it entails. In suffering, the price for faith in it is so immense that crucifixion of the Son of God is offered daily at its darkened shrine and blood must flow before the altar where its sickly followers prepare for death. 5 Yet will one lily of forgiveness change the darkness into light, the altar to illusions to the shrine of Life Itself. And peace will be restored forever to the holy minds which God created as His Son, His dwelling-place, His joy, His love, completely His, completely one with Him. I can be free of suffering today. 1 Father, I thank You for today and for the freedom I am certain it will bring. This day is holy, for today Your Son will be redeemed. His suffering is done. For he will hear Your Voice directing him to find Christ's vision through forgiveness and be free forever from all suffering. Thanks for today, my Father. I was born into this world but to achieve this day and what it holds in joy and freedom for Your holy Son and for the world he made, which is released along with him today. 2 Be glad today! Be glad! There is no room for anything but joy and thanks today. Our Father has redeemed His Son this day! Not one of us but will be saved today. Not one who will remain in fear, and none the Father will not gather to Himself, awake in Heaven in the Heart of Love. What would the day look like if we accepted freedom from suffering today? What would be present in our day, and what would be absent? Jesus speaks to us about this today, but it is no different than any other day. It is just that when we give reality to time, we put off until tomorrow what we could accept today. We think that maybe if we do enough work, the day will come when we will be free of suffering, but why not now? Until we accept the truth of what we are, we repeat the same mistake daily by believing in what we have made, believing in the separation, believing in sin and guilt, and fearing punishment in the future. What keeps us from the truth is the belief that we are unworthy of love. Yet Jesus says that this is impossible "because you are the treasure of God, and what He values is valuable." (T.8.VI.5.13) (T.8.VI.46) He goes on to say that this is because we did not make ourselves. All we have done is held onto a belief in unworthiness; but now we can make another choice, which is to release what we hold against ourselves and give it over to the Holy Spirit. We can simply side with the truth instead of our false beliefs. We can stop searching for what we already have. We are all the same, and we all want to know our innocence. To see a brother as guilty only hurts us. The light of God is shining in us now, but if we do not experience it, we are actively choosing to resist it, which is insane. We can make another choice. All our suffering comes from the wish to be who we are not. This wish gives rise to our thoughts, which bring our experience of suffering. We develop strategies and defenses to protect ourselves from suffering. While we hold onto these defenses, strategies, thoughts, beliefs, and stories, we continue to feel like victims of external events. But there are no victims and victimizers. This Lesson helps us to realize that the cause of all suffering starts with our false beliefs that we cling to. We are now invited to look at them and allow forgiveness to shine them away. We increasingly see that investing in our egoic thoughts only brings more pain, suffering, and guilt. The question is, why do we so persistently hold onto guilt and resist forgiving when we would be so much happier if we let it go? We resist forgiving because of our attraction to guilt and our determination to be right about the way we see others. We are still attracted to guilt because we don't associate guilt with pain. We think that projecting guilt and seeing it in others is our way out of pain. We think judging others and holding them guilty is how we maintain our own superior position of innocence. We see guilt as attractive because it maintains our separate self. Thus, as long as we see guilt as our salvation and love as our damnation, we will be unwilling to give up this false self. We live in a split mind where on one side we want what we value, which is our own thoughts, and yet on the other side, we want peace and love offered to us through this practice. The continuing attraction to guilt, pain, death, victim, and victimizer keeps us rooted in the illusion, but this need not be. It is time to side with truth and refuse to listen to the ego. You are totally innocent now. You are the Christ. You are One with God and with every brother. Accept that as the truth. Don't wait for tomorrow. Choose peace now. When we can see what we are doing to ourselves, our motivation increases to let hurtful thoughts go. As we see how we hurt ourselves, we become more willing to take ourselves and others off the cross. When we experience the joy and peace that come from bringing our unforgiving thoughts to the truth, we develop more trust in this process. Think of a difficult relationship you have and look at the resistance in your mind to let that person "off the hook" for what you believe they have done. This is an example of resistance to forgiving and attraction to guilt. Or think of someone you have elevated as superior to you. Your feelings of unworthiness in relation to that person are another example of this attraction to guilt. You are choosing to believe thoughts that are not true and maintain the gap with your brother. Jesus reminds us, "Babies scream in rage if you take away a knife or scissors, although they may well harm themselves if you do not." (T.4.II.5.2) (ACIM OE T.4.III.28) They think that their pleasure is in playing with what will hurt them. We are like those babies, believing we know where our pleasure comes from, how our judgments serve us, and what will bring us happiness. Jesus reminds us that our sharp-edged toys, which we think are the source of our pleasure, actually cause us pain. He invites us to look at how we hurt ourselves with what we think we need and want. Jesus will never coerce us to give up what we still think we want, but he clearly shows us what the cost is to us. He shows us that our way only brings unhappiness. Thus, to release judgments is to serve our own self-interests. Our efforts in this regard are on behalf of our happiness. The ego tells us that once everything falls into place, we will know peace and happiness. Spirit says to choose peace now and everything will fall into place. Choose peace in all circumstances. Everything we experience is what we have called into our lives, and it is all perfect for our awakening, regardless of how we see it. There is nothing that should be different. We just need to recognize the perfection of it all. When we accept it all without judgment, we take a giant stride in healing. 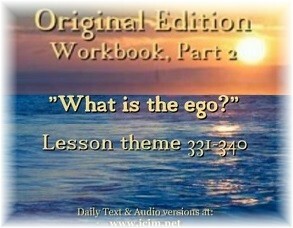 In Chapter 29, Section VII "Seek Not Outside Yourself," (T.29.VII) (ACIM OE T.29.VIII. "The Lingering Illusion" ), Jesus reminds us, we weep each time an idol falls. We invest in idols, which we substitute for God's Love. We hold onto these idols, believing they are the source of our happiness. When the idol is broken, stolen, lost, or leaves, we suffer. We suffer when we don't have it and want it, and we suffer when we have it and fear losing it. Our only true happiness comes from remembering who we are. Any other search for happiness is futile. Until we are ready to accept this, we continue to look for happiness outside of ourselves and demand things be different than they are. "For all your pain comes simply from a futile search for what you want insisting where it must be found. What if it is not there?" (T.29.VII.1.7‑8) (ACIM OE T.29.VIII.43) Our attachment to our separate identity, to our specialness, and to special people, things, and events of this world will never bring happiness. As long as we focus on the idols, we will not recognize that the source of pain and suffering is in our own mind. It has nothing to do with how things go in the world. In fact, the purpose of this world is to keep us from the truth. Jesus acknowledges that we are here because we still have hope that something outside of ourselves will bring happiness and peace. We wander aimlessly, searching for this "something" that we will never find, until we become "disillusioned" with our seeking, looking for happiness where it cannot be found. It is then that we become willing to choose another way. The power of choice is our own. We can take as long as we want. The question is, are we willing to look at our painful experiences and realize that they are of our own choosing? When we do, we can either ask for help to release them, or use these experiences to continue to justify suffering. What was meant to curse can now bless! We all have this incredibly deep, prevailing desire to go home. We may experience it as a yearning for our childhood home, our desire to return to our origin, a yearning for the good old days, or a yearning for a peaceful place somewhere in the world. It is well described in the very poignant movie, Trip to Bountiful, which shows how deep and prevailing this yearning is. An elderly woman does everything in her power to return to her childhood home against the wishes of her family. The music playing in the background is, Softly and Tenderly Jesus is Calling , ---calling all sinners to come home. Another wonderful movie, August Rush , provides a similar theme of the pain of separation and the call to return home. When movies tug at something very deep within us by eliciting this longing, it is an indication of how much we yearn to know our Self. It is a longing for our true home in God. Why are we here? According to this Lesson, it is only to achieve, in this day, a day free of suffering, a day of seeing with Christ's vision. Every day that we are on this earth, this can be our spiritual aspiration until we come to the realization of who we really are. When we experience difficulty in our day, there is such a temptation to feel bad. When we don't meet our own expectations for what we set for ourselves as spiritual achievement, we judge ourselves; but this is not helpful. The truth is that we need do nothing. We are already redeemed. All that is needed is to be willing to look at our judgments without judging ourselves and be willing to let them go. We do not need to fix or to try to change ourselves. All healing is done by the Holy Spirit. All we need to do is look, be watchful of our minds, and simply be willing to look at what comes up. Remind yourself that any pain and anguish you are feeling is a false belief that you hold and is not the truth about you or anyone else. Willingness is all that is called for. Perfection is a standard that the ego wants to set up for you so you can crucify yourself when you fall short. Continue to do the work, but be gentle with yourself. Finally, we are reminded in this Lesson, it is a day of joy and gratitude. "Be glad today! Be glad! There is no room for anything but joy and thanks today." (W.340.2.1-3) With a grateful heart, let us embrace the Lesson and know with certainty that we have help along the way, and we can choose again, in every moment of distress, to be joyful in our day because our purpose is set. Jesus tells us, "Make this year different by making it all the same." (T.15.XI.10.11) (ACIM OE T.15.XI.112) He reminds us that every situation, person, or event that we encounter in this dream is just another opportunity for forgiveness. And we do it over and over again until we recognize that this all the world is for. It truly is like "Groundhog Day". Instead of treating every situation and event as having degrees of difficulty, realize that they all have one purpose---the healing of the mind through forgiveness. That is what today is all about, as is every day. Make every day the same.